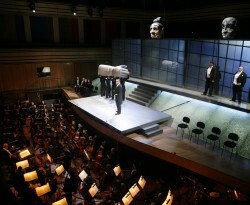 The ten editions of the Wagner in Budapest Festival to date can rightly lay claim to a monumental feat: the staging of all of Wagner's classic operas in unique adaptations tailored to the unique properties of the Béla Bartók National Concert Hall. The series returns in 2016 with the now world-famous production of the Ring of the Nibelung tetralogy, as well as the hugely successful Meistersinger von Nürnberg. The outstanding Wagnerians regularly returning to Budapest will once again include Judit Németh, Tünde Szabóki, Waltraud Meier, Annette Dasch, Christian Franz, Gerhard Siegel and Walter Fink. The celebrated festival's artistic director is Kossuth Prize-winning conductor Ádám Fischer.